A day after its agreement was terminated with the FEI, the American Quarter Horse Association said it “does not feel it has breached the terms of the agreement”, and welcomes continued dialog with the FEI. The termination of the FEI agreements with both the AQHA and the National Reining Horse Association (NRHA) were announced at the FEI’s General Assembly in Manama, Bahrain, earlier this week. Both groups were told that a binding commitment to implement the FEI rules on anti-doping, stewarding requirements and the age of competing horses are prerequisites for any future cooperation. The AQHA said it disagrees with the allegation that it has breached its agreement, and welcomes continued dialog with FEI. “As always, AQHA’s commitment to the sport of reining and to upholding the well-being of the American Quarter Horse in competition remains a top priority,” the association said in a statement. “With respect to the welfare requirements addressed by the Cooperation Agreement, AQHA’s regulations and practices, in particular those associated with stewards and drug testing, are consistent with and meet such requirements. Simply put, our top priority as an association of horsemen is the health and welfare of our sport and of this great animal. The AQHA said it “actively implements measures to protect American Quarter Horses competing in reining and all disciplines”. “AQHA began drug testing in 1973, establishing itself as a leader in welfare among equine breed associations. The drug-testing program is designed to ensure that horses competing in AQHA-sanctioned competition are doing so in a manner that will promote the safety and well-being of all horses competing and ensure the enforcement of fair and equitable rules and procedures. In each instance that FEI has notified AQHA of a penalty imposed by FEI as a result of a drug violation, AQHA has afforded reciprocity. “In addition, the AQHA stewards program plays an important role in advocating for the horse and helping to safeguard fair competition. Stewards help to ensure that legal tack and humane practices are used and appropriate conduct is displayed at AQHA shows and events. 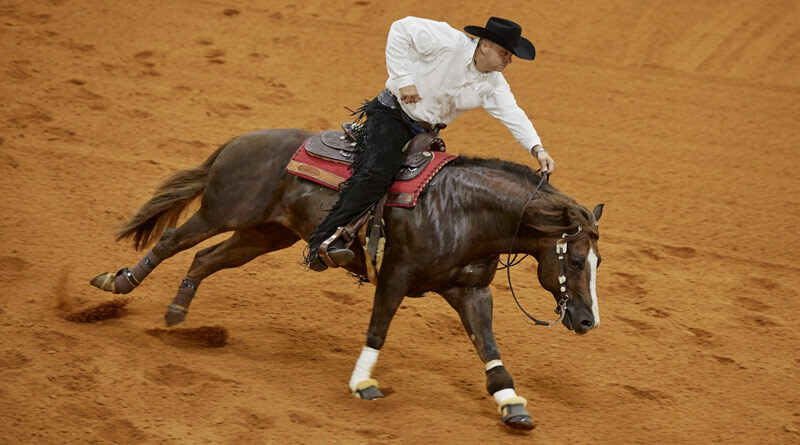 AQHA stewards are trained and tested to protect these athletes and, most importantly, to protect the breed, advance animal welfare and ensure the integrity of the competition, including reining. Hats off to you FEI for standing up to the AQHA. For years they have created disposable show horses. It’s sad that these horses go through brutal training from the age of two, showing for the big money until they reach maturity. Then they seem to be retired never to be heard from again or even worse end up in the kill pen. I showed my quarter horse until he was 27 years old, he only stopped because his legs could stand the trailer ride. He loved it every time we hooked up the trailer, he was alwayswaiting to go. I love it that you require them to be older, the older they get the more they love it. You can see the passion in their patterns. Love watching these guys! Now those are true Quarter Horses! So horses are used up by age 7 then shipped to the slaughter plant loaded with drugs. Hmmmm, any connection? Most are AQHA horses, brutally abused, injured beyond repair, sick and diseased, again, FEI may be considering the Real Truth. Well done FEI for taking a stand and not being bullied by the AQHA. Here is yet another example of Americans wanting to break with the rest of the world in matters of global cooperation. Whether it is Iran sanctions or global warming or international trade, their lack of cooperation is selfish and harmful. Unfortunately there are few that stand up to them. But the FEI is a bastion of strength and a powerful advocate of animal welfare. This is positive activism and all of us that compete under FEI rules should be proud of the FEI and their courage.